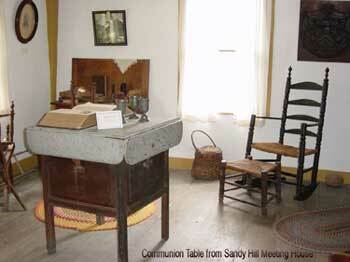 The north parlor is called the Communion Room because we have the communion table and pewter chalices from the Sandy Hill Meetinghouse. The first meetinghouse in Amesbury was a small, simple structure. The meetinghouse served not only the religious needs of the community, but it was here that town meetings and court proceedings were held. 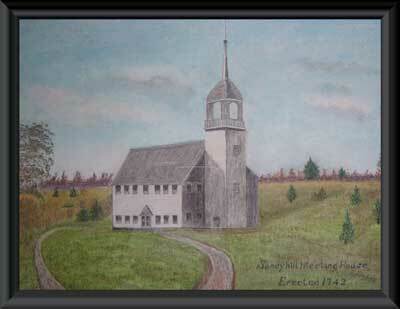 By 1715, the growing community erected the Sandy Hill Meetinghouse. Many Colbys have been identified as Deacons of this church, which stood not far from the Macy-Colby House. The north parlor has three plastered walls and one inside, paneled wall that houses the fireplace. The outer corners have exposed 'gunstock' corner posts; this complex jointed post holds the walls, ceilings and roof frame. An eclectic collection of furniture and pictures fill the room, from a gaming table and a Victorian-era rocker, to a flax spinning wheel, and a Federal-era sofa. Pictures include memorial plaques, a Colby coat of arms painting, and Osgood family portraits. 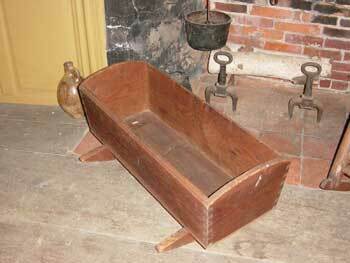 The Martin-family cradle once belonged to Amesbury resident Susannah North Martin. She was accused of witchcraft and hanged July 19, 1692 in Salem, Massachusetts. It had begun in January when eight young girls from Salem Village began suffering from delirium, convulsions and trances. The authorities concluded the girls were being bewitched. Within a year, the hysteria had ended but not before nineteen men and women were hanged and one man pressed to death with rocks.